The pentagram is a recognised and important symbol of witchcraft, it is a five pointed star with a single upright point, this represents spirit above matter, inverted it represents matter above spirit, and is associated with gain. It is a disk made of clay, wax, copper, wood, silver or gold. Silver is the metal of the Moon, the element of water and psychic forces, while gold harnesses the element of fire, and is the metal of power and energy. Witches wear a pentacle as an amulet or talisman, for protection and as a sign of their craft. Pentagrams can be drawn on clothing or engraved on rings. Other names for the pentagram are the Devil’s Star, the Endless Knot, the Goblin’s Cross, and the Witch’s Foot. A magician’s pentacle is called the the Pentacle of Solomon. The pentagram is recognised as protection against evil and negativity, it is as relevant to the practice of witchcraft as the wand and broomstick, it is considered a religious symbol and a symbol of Witchcraft. The pentagram dates back thousands of years and was used in many cultures. The Arthurian knight Sir Gawain, had one engraved on his shield to represent the five virtues of knighthood, noble generosity, fellowship, purity, courtesy and compassion. Pentagrams have been found by archaeologists dating back to 3000 BC, and were considered a powerful symbol by the ancient Egyptians, Greeks and Romans. To Pythagoras the pentagram was a mathematical perfection, it was referred to as Hugieia meaning health, and Hygieia the Greek goddess of health. 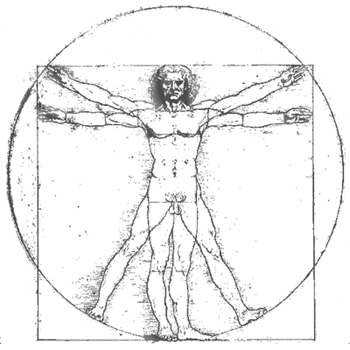 It is seen to represent the human form and the five senses, sight, smell, taste, touch and hearing, spirit and the four elements of nature, and the five points of man, head, arms, legs, as represented in the image of the Vitruvian Man. To witches it symbolises the three aspects of the Goddess – Maiden, Mother, and Crone. The circle around the pentagram symbolise unity, wholeness, the goddess, protection and infinity and as a way to bind the elements together. A pentagram is used to consecrate the magic circle, ground energy and cast spells, during rituals a witch may stand with arms and legs outstretched, symbolising birth and rebirth. In ritual pentagrams are drawn in the air using a sword or athame, the methods used to draw a pentagram are precise and peculiar to a particular ritual. The pentagram is the Witches’ symbol of protection, it is used to summon the elements, for meditation, and all other aspects of magic practice. Drawing a pentagram in the air is a way of consecrating your altar and all the items on it, a pentagram to invoke is drawn differently to a pentagram to banish. A banishing ritual is performed to remove all negative energy and an invoking ritual is performed to draw in positive energy. The pentagram allows a witch to create and manifest, as the power of the pentacle works with the will of the practitioner. Invoking pentagram – The invoking ritual requires you to draw a pentagram in the air using a sword or athame, beginning at the top point of the pentagram you trace the shape of the pentagram in an anti-clockwise direction, finishing at the top point. Your invoking pentagram is then complete. Banishing pentagram – The banishing ritual requires you to draw the pentagram in the air while holding the athame, but in reverse order to the invoking. To banish you begin at the bottom left point of the pentagram and trace the shape in a clockwise direction, finishing at the bottom left point. Your banishing pentagram is then complete. The Elements – Each direction has a particular power and association, Spirit, Air, Water, Fire, Earth, and these elements may be invoked during rituals. There is a specific invoking pentagram associated with each element. You may perform invoking and banishing pentagrams. 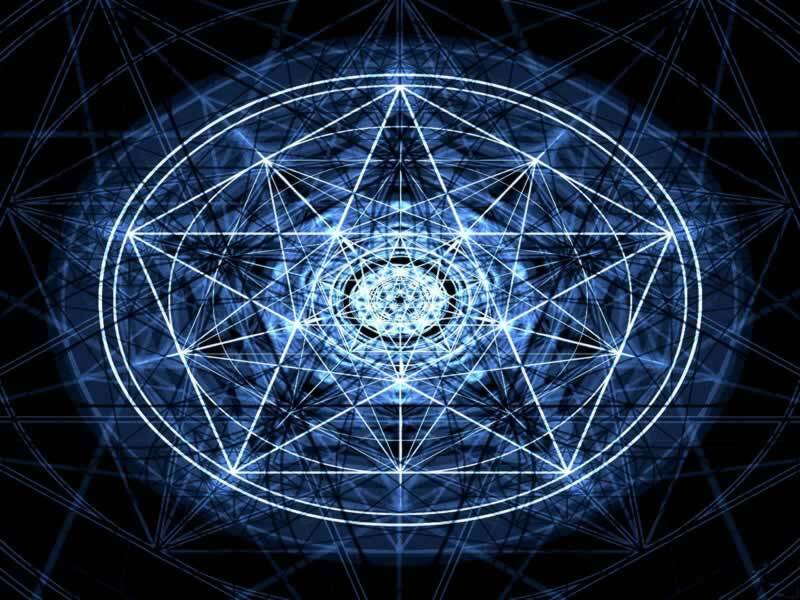 Invoking Spirit – Hold your athame in the air, beginning at the bottom right point trace the pentagram in the air, moving it clockwise along each point until you finish at the bottom right. Invoking Earth – Hold your athame in the air, beginning at the top point trace the pentagram in the air, moving it anti-clockwise along each point until you finish at the top point. Invoking Air – Hold your athame in the air, beginning at the far right point trace the pentagram in the air, moving it anti-clockwise along each point until you finish at the far right point. Invoking Fire – Hold your athame in the air, beginning at the top point trace the pentagram in the air, moving it clockwise along each point until you finish at the top point. Invoking Water – Hold your athame in the air, beginning at the far left point trace the pentagram in the air, moving it clockwise along each point until you finish at the far left point. Banishing Spirit – Hold your athame in the air, beginning at the bottom left point trace the pentagram in the air, moving it anti-clockwise along each point until you finish at the bottom left. Banishing Earth – Hold you athame in the air, beginning at the bottom left point trace the pentagram in the air, moving it clockwise along each point until you finish at the bottom left point. Banishing Air – Hold your athame in the air, beginning at the far left point trace the pentagram in the air, moving it clockwise along each point until you finish at the far left point. Banishing Fire – Hold your athame in the air, beginning at the bottom right point trace the pentagram in the air, moving it anti-clockwise along each point until you finish at the bottom right point. Banishing Water – Hold your athame in the air, beginning at the far right point trace the pentagram in the air, moving it anti-clockwise along each point until you finish at the far right point. When performing any type of ritual a pentacle can be worn for protection and empowerment. If you wear a pentagram on a daily basis it is up to you whether you are discreet or want to wave the witch’s flag.